Chester were left short-changed for a dominant effort as 10-man Guiseley held out for a 1-1 draw at the Swansway Chester Stadium. It was the visitors who opened the scoring in the first half, Kayode Odejayi heading well beyond Grant Shenton before ex-Blue Andy Halls saw red for an alleged two-footed challenge on Gary Roberts to close the opening 45. 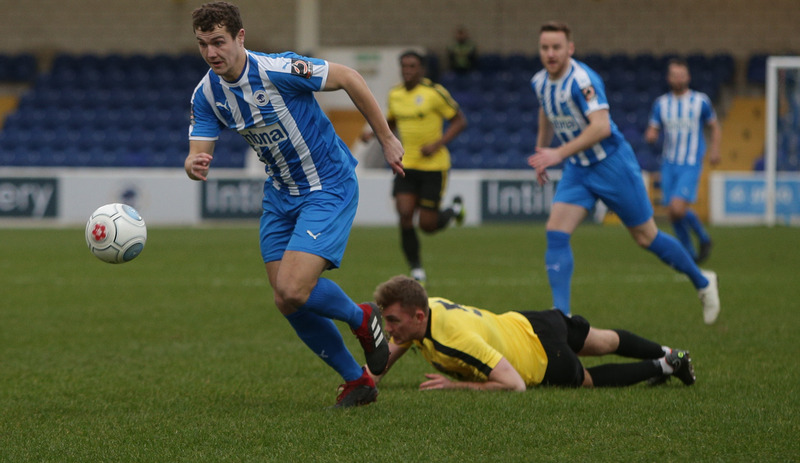 The Blues levelled the scoring ten minutes into the second-half with Anthony Dudley’s headed effort but were made to rue missed chances, and failed to secure, what would have been a deserved three points. Chester made two changes to the side that saw off FC United of Manchester last weekend, midfielder Sean McAllister made his first start for the Seals since signing on Friday, replacing the suspended George Green. Former manager Marcus Bignot named Halls and another ex-Blue in Kingsley James as part of his lineup, with top scorer Rowan Liburd leading the line as usual. After a slow opening five minutes it was the visitors who produced the best chance of the opening exchanges, the usually reliable Liburd found himself one-on-one after McAllister appeared to be fouled, but the Lions’ talisman curled wide of Shenton’s goal. A scrappy, uneventful opening quarter of an hour culminated in a superb McAllister delivery which evaded the heads of both Dudley and Craig Mahon by mere millimetres. A goalmouth scramble following two resulting corners gave the away side a scare as ‘keeper Marcus Dewhurst appeared to spill the ball into the path of two Blue shirts but the Guiseley stopper recovered well. Then with the first shot on target of the game after twenty minutes, the Blues conceded their first goal of 2019. A Danny Livesey handball gave former-Blue Halls the chance to deliver a free kick into a packed penalty area. He sent forward an excellent cross, which found the head of the towering Odejayi and, consequently, the back of Shenton’s net. 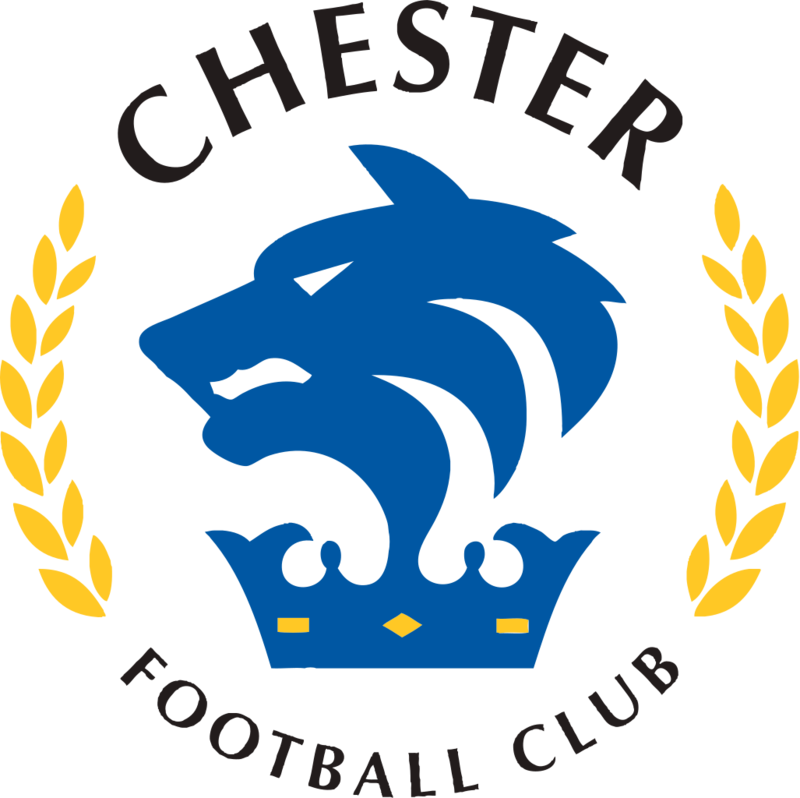 Chester’s best chance of a half lacking in entertainment started with a tame Roberts free-kick which struck the bottom of a tall Lions wall, before Deane Smalley lashed over from the edge of the box into the Harry Mac. Then, on a cloudy afternoon at the Swansway Chester Stadium, the red mist descended on Guiseley’s Halls. The visiting captain went in two-footed on Roberts in the middle of the park, with referee Amy Fearn brandishing red after consultation with her linesman. Questions could be raised over whether Roberts was equally fierce in the challenge, although whilst the Blues went into the break a goal behind, they had a man advantage to capitalise on. The Seals started the brightest after the restart, Dudley glancing a header across but well wide of Dewhurst’s far post. Then with a second bite of a cherry, Chester’s top scorer reached double figures, as he was on hand to head the hosts level on 55 minutes from close range, Roberts’ cross for the equaliser a peach. The Blues continued to dominate proceedings, Bradley Jackson a menace with his pace down the right flank. Down the left, alternatively, Mahon was also causing problems, cutting onto his favoured left foot and rifling a shot across Dewhurst’s goal but this was palmed away smartly. Chester came agonisingly close to taking the lead with 72 played. 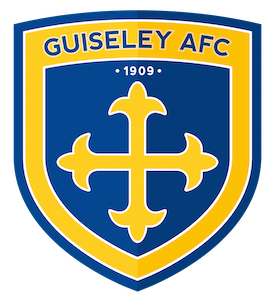 Smalley played a clever backheel to allow Dudley a one-on-one chance, but two Guiseley shirts were quickly on-hand to recover and close the goalscorer down. Another excellent Roberts delivery to start the last five minutes of regulation time narrowly missed the connection of Simon Grand at the back post. A huge chance for substitute academy graduate Nathan Brown was squandered from 12-yards out moments later. With five minutes of additional time raised by Jimmy Soul, Grand aimed his free header wide of the far post. Despite their dominant efforts, the Blues lacked enough clear-cut chances and Fearn blew the final whistle with the Seals were forced to share the spoils with 10-man Guiseley. Chester are back in action at the Swansway next Saturday, as we welcome Curzon Ashton. CHESTER: Shenton, Jackson, Grand, Roberts, Livesey, Howson, Mahon, McAllister, Smalley (Brown 77), Dudley, Mooney (Waters 69). SUBS NOT USED: Moran, Noble, Murray.